The following is the unofficial transcript of a CNBC interview with National Economic Council Director Larry Kudlow on CNBC’s “Power Lunch”, Friday, March 29th. Video from the interview will be available on CNBC.com later today. 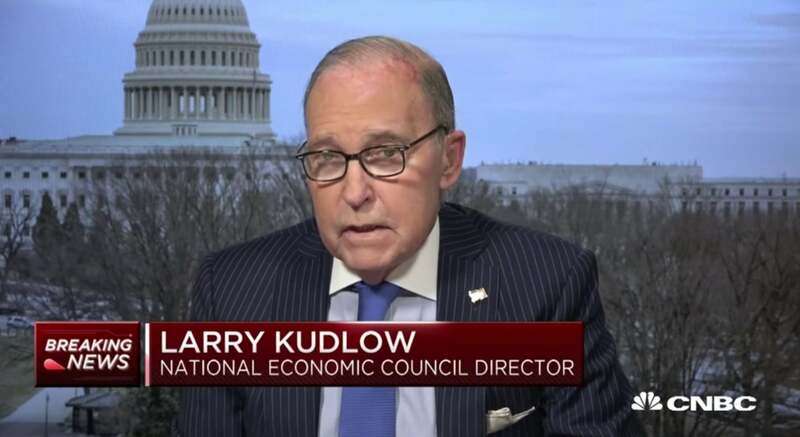 KELLY EVANS: Back with us is Larry Kudlow, National Economic Council Director. You’ve been deeply involved in the trade talks with China. You were very optimistic a couple of weeks ago. Are you as optimistic today? LARRY KUDLOW: Yeah, look, we are still making great headway including these talks. Those two fellows, Mnuchin and Lighthizer, I think they are still on the airplane coming home, but the last message we got is they made more headway. They’ve been making been headway through teleconferencing and what not. This is the kind of thing you have got to take a day at a time, a week at a time. So they’ve been over there. They are coming back. Liu He and his team, the Chinese team will be here next week. We will continue those discussions. KELLY EVANS: But there are some market participants who wonder, Larry, if the reason why you’re calling for a half percentage point rate cut is because, you – not you, the administration needs more time on the China deal. Would you be calling for that if you thought, ‘Hey, this thing is happening and it’s imminent,’ or is it because we’re hearing now June or later until it happens? LARRY KUDLOW: No. No linkage, frankly. No linkage. And I don’t want to get -- the timetable thing is a bad exit off the highway any way. What we want is a really great deal for the United States. That’s been the President’s view from day one. And we’ve made terrific headway. I mean this is the largest scale, deepest discussion of trade between the two countries ever. And if an agreement is there, it will be an historic agreement. That will be pro-growth for both countries and the rest of the world. But it has to be done right. And that includes, you know, Bob Lighthizer is a brilliant trade guy. The enforcement issues have to be done properly, the IP theft, the forced transfer of technology. The cyberhacking, the commodities, the tariffs, the non-tariff barriers. It’s got to be right for the USA. And whatever the timetable is -- and I think, frankly, if you look at it, you know, a little patience is not a bad thing. It’s been less than a year in this round. And we went there, they’re coming here. That’s a good sign. These are all very positive signs. But it’s not related to the interest rate discussion, at least in my mind. MELISSA LEE: Do tariffs come off if a deal is reached? How should we look at tariffs in terms of being a punitive measure perhaps if enforcement is not on the deal? LARRY KUDLOW: You know, Melissa, those issues will be part of the enforcement mechanism. And as Bob Lighthizer has testified, there’s a multi-tiered enforcement mechanism, you know, complaints dealt with on the ground, at a deputy’s level, and then at a principal’s level. The trick here is first of all, the United States is not satisfied, we will use tariffs. The President I think has told all of us the tariffs are very important in these negotiations. On the other hand, if you have a complaint, let’s fix the complaint on the Chinese side. Regarding tariffs themselves in general, I don’t want to go really through that. There will be discussions and decisions made the president has said publicly and I think that’s the key point, we are not going to withdraw our tariffs. We are not. Now, would some be withdrawn? I don’t really want to get into that. These things are done as a matter of the negotiations. That’s up to Mr. Lighthizer. LARRY KUDLOW: In a deal -- in a deal that we sign. MELISSA LEE: You’re right. Exactly. If they don’t stick to it, an enforcement mechanism is such that tariffs will actually be higher than what they are now. LARRY KUDLOW: If they don’t stick to it, there will be significant risks there. LARRY KUDLOW: If they do stick to it, those risks will be ameliorated. I think that’s just a matter of common sense. TYLER MATHISEN: What -- what have you learned in the past year, not just generally, but about tariffs and their utility? LARRY KUDLOW: Well, I will tell you, as a free trader, confirmed free trader, I really think the President has taught me and a lot of other people that tariffs have an important use in trade negotiations. You can get through the intransigence – I mean, if your goal is free, fair, and reciprocal trade, if you believe, as he does, that in a pure world, we should have zero tariffs and non-tariff barriers and subsidies, you have to get there. And a lot of the world trading system is broken down. The WTO has not done its job. We believe again China has been, you know, in noncompliance in many different areas. Others believe that, too. Europe and Japan join us. So tariffs play a role. And I think I’ve learned that. And I’ve watched it. And particularly in the Chinese negotiations -- that’s probably the best example, all right. The President was tough on China with tariffs. We hurt China economically, they’re already on the downslope. But here we are, deep into negotiations that perhaps will turn out very well. That’s one of the things I’ve learned. LARRY KUDLOW: I know where you’re going. TYLER MATHISEN: You were an unrepentant free trader. LARRY KUDLOW: I am now involved in it hands on, real world. I’m not the purist I once was. And the President is a pretty good negotiator. That’s what I’ve learned. KELLY EVANS: Just on the issue of tariffs, the Mexican Canada agreement is at risk of stalling in Congress, according to The Washington Post, because of Chuck Grassley who wants the President to lift steel and aluminum tariffs on those two countries as a pre-condition to the vote, and says Trump will have to give in on that in order to get this thing passed. LARRY KUDLOW: Well, look: Bob Lighthizer is you know, heavy into that. First off, let me say one thing: the USMCA deal is really an important deal. It sort of gets overshadowed now by the China thing. If you go into that deal, in terms of domestic content and wages, if you look at that deal in terms of the new economy, breakthroughs, IP protections we’ve never had, financial services inroads, biologic inroads, digital inroads, I mean we’re finally getting through on the dairy farm stuff to help our farmers. It’s really a good pro-growth deal. Currency stability. I mean, this really is, as Lighthizer says, it is a template for a lot of deals. Now, to your point, Kelly, he is negotiating with Canada and Mexico regarding tariffs and quotas. And I don’t want to get in the middle of the -- the outcome will be determined. He’s aware of the issues. He’s aware of the pressures. But we’re – you know, we’d like to do that deal. Again, like any other deal, it’s got to be right. It’s got to be right for the U.S.A.
LARRY KUDLOW: The USMCA is a really important thing. And we ask help from everybody to get that thing passed. It really would be good for growth. It’s a terrific thing. MELISSA LEE: Larry, it’s been pleasure. LARRY KUDLOW: Alright. Appreciate it. TYLER MATHISEN: Larry, it’s good to see you again. Nice to have you in house. LARRY KUDLOW: Thank you, folks. Nice to visit with you. Very good. TYLER MATHISEN: We’re at session highs. I wonder if there’s a connection there. You brought us good luck. TYLER MATHISEN: Take it, man.